This post’s been rotting w/ the Draft status for about a week now. It’s like this is never going to leave. We’re in Feb now and I’ve written exactly three [meaningless] posts in the last month. Speaking of which, January was fan-tas-tic. Excellent fun all month long – the best four days of which were, of course, Saarang! Hell, likely the best four days of the year even – and it hasn’t even started! 😀 I’m not going to be detailing a lot of things, simply cos I can’t remember. We were too high on kookiness for that. Vicks Wild Cherry Cough drops. Going w/o sleep for little over 50 hours straight. I did so many things and met so many people in that period, it’s surprising I didn’t get whiplash! It’s all a rather hazy, sepia-tinted memory but with OMG-AWESOME written all over it! The awesome chaat-wala who always gave me free paapdi every time I was around his stall. The endless, endless cups of cappucino and glasses of ginger-lime fizz. Generous friends. Generous strangers. Finally getting to meet Nith, Sharan, Shrey & Vini! 😀 Pechu varthai. Much hyperness! Blowing bubbles in arbit places w/ the bubble-liquid Nith gave me. Thanks, girl! 🙂 Public that was much amused. That girl who squealed as a bubble bounced off her nose. That boy who winked when I grinned at a double bubble. Scrabbling through the night w/ Sharan, at the OAT. Getting soaked in dew and an incredible chill. Realizing what studness Scrabble is. Watching the indigo of the night sky percolate into the pinkish-gray of daybreak. Josh, Patent & Symmetry. An overdose of insti IITM lingo. V and her two cousins. Sassy smartmouths who make you laugh. A LOT. Terribly graphic conversations under the glow of street-lamps. Walking the empty roads of IITM in solitude. Daydreaming and swaying, music in my ears. Opeth. \m/. Feeling the music reverberate in your chest and then roaring your lungs out in a sheer rush of adrenaline. Smoky lights. Zoning out for a whole ten minutes. Crash. Shrey. Headbanging frenzy. An incredibly trippy walk at dawn in the less-frequented parts of the campus, w/ someone equally compelling. Warm fingers. Pictures. Nietzsche. Surrealism. 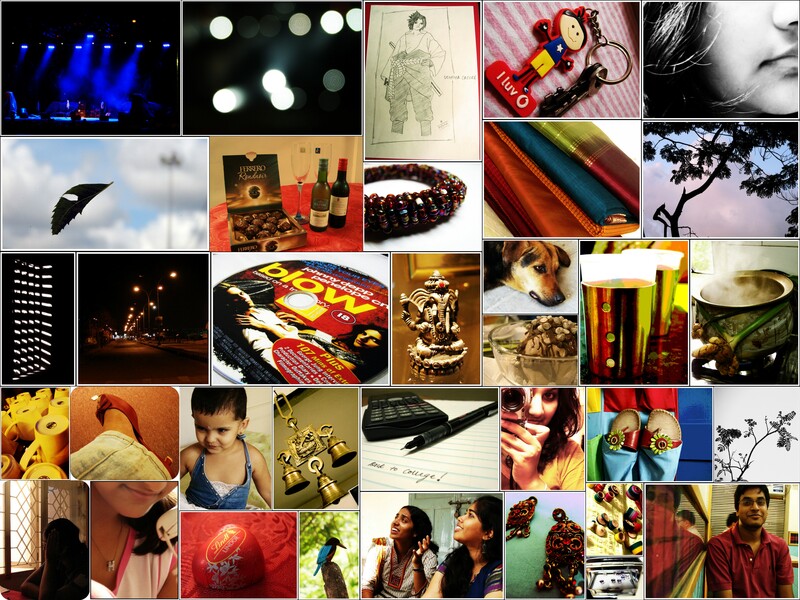 As is Project 365 to you, so is ‘Follow the Project 365’ for me! Me louws the project 365 shoe picture. “Colour me happy” 🙂 The title is SO perfect 🙂 It does colour me happy ! It’s hella lot of fun! Thanks! 🙂 The shoe picture is a personal fave too! Pechu varthai only. 😛 And that line is my absolute favourite ever! Ooh, and if DT does an album w/ that theme, I can’t begin to imagine HOW trippy it’s going to be! Heh. They were funny. Very amusing. 😛 And I like that phrase! Trippiness. Most desirable state of mind ever. you say ‘arbit’ a lot!